Judy Istock Butterfly Haven is a 2,700 square-foot greenhouse at the Peggy Notebaert Nature Museum. On any given day, it houses about 1,000 butterflies from over 40 different species There are also several bird species from the Southern hemisphere. The greenhouse has a self-contained ecosystem with a small fountain and water-pool, flowers, tropical trees. A walk through the glass atrium of butterfly haven, is a perfect escape from the hustle and bustle of the city. 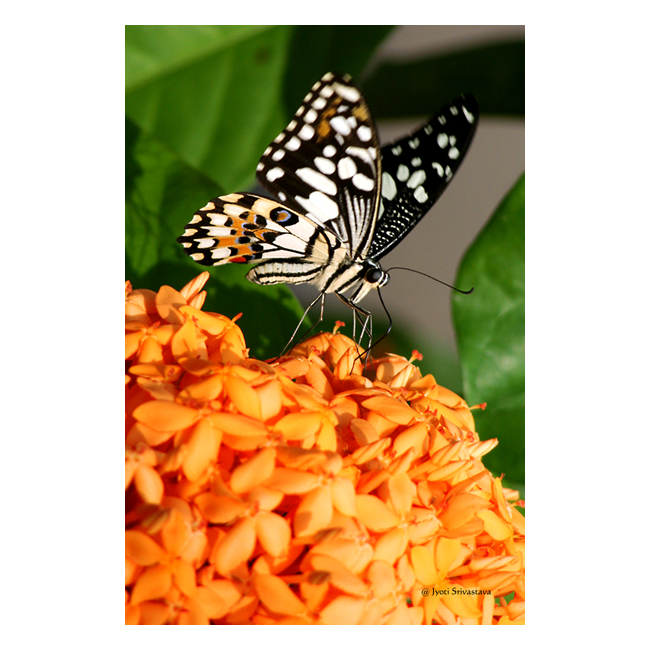 One can enjoy the flight of birdwings, swallowtails, painted ladies and many more types of butterflies. 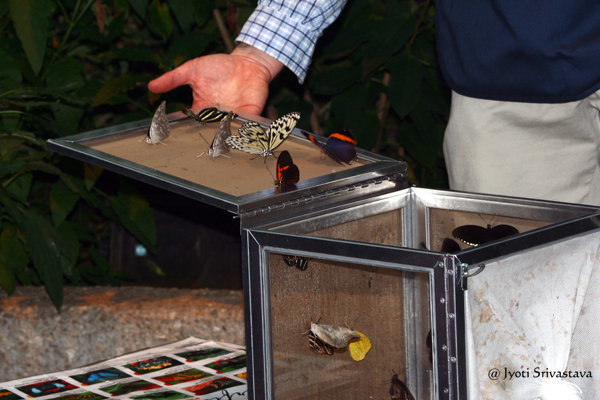 Added feature is the release of new butterflies every day at 2:00 p.m. One can see a butterfly’s first flight ever! There are always volunteers to help with any queries. The butterflies are from tropical areas, they like things warm and humid. So the temperature is controlled at 80 to 85 degrees Fahrenheit and with 20 to 30 percent moisture. The greenhouse is equipped with watering and heating system that automatically adjusts the environment around the clock. There are misters showering water vapor to keep the atmosphere humid. Once upon a time, not long back, in the year 2007 to be precise, I used to visit Judy Istock Butterfly Haven every month. I observed the butterflies doing their normal things: sunning, sipping nectar, embarking on courting rituals and even mating. Somethings I learnt about butterflies: Camouflage, Sexual dichromatism and polymorphism. 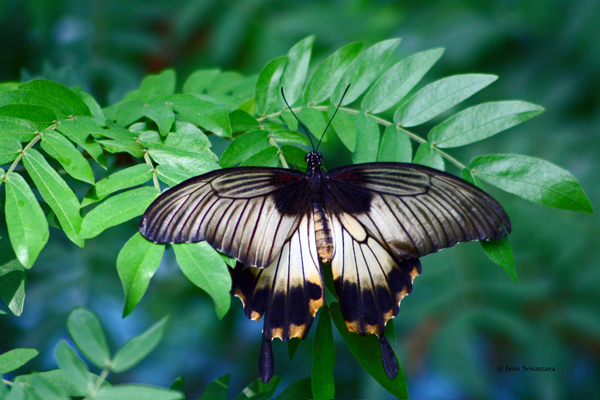 In this post I share some interesting facts about butterflies. In the day-to-day activities of a butterfly, feeding is important, but equally important is basking, especially if the temperature falls down. Butterflies are cold-blooded, meaning they cannot regulate their own body temperature. As a result, their body temperature changes with the temperature of their surroundings. If they get too cold, they are unable to fly and must warm up their muscles in order to resume flight. Butterflies can fly as long as the air is between 60°-108° F. If the temperature drops too low, they may seek a leaf or a rock in a sunny spot and bask. Butterflies bask with their wings spread out in order to soak up the sun’s heat. When butterflies get too hot, they may head for shade or for cool areas like puddles. making it difficult for predators to spot them. 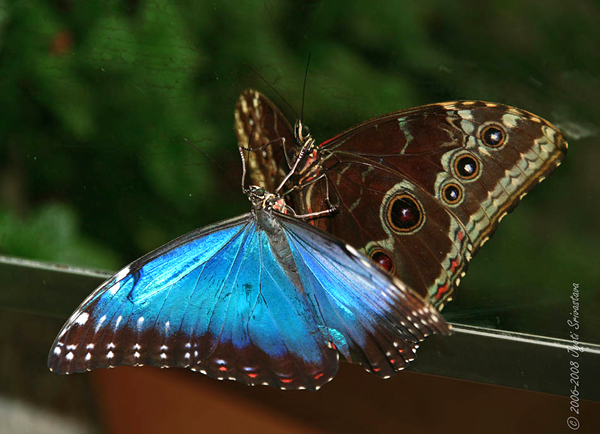 The Morpho butterflies are among the largest in the world, with a wingspan of 7.5 to 20 cm. The males have beautiful metallic blue upper wings, while the females are drab. Their iridescence stems from the microscopic structure of their wings. This iridescent surface helps it to elude potential predators. When they fly, the upper surface of their wings continually changes from bright blue to dull brown. They seem to disappear, and then reappear looking like flashes of bright blue light. Combined with an undulating pattern of flight, this ability to change color quickly makes them difficult for predators to pursue. 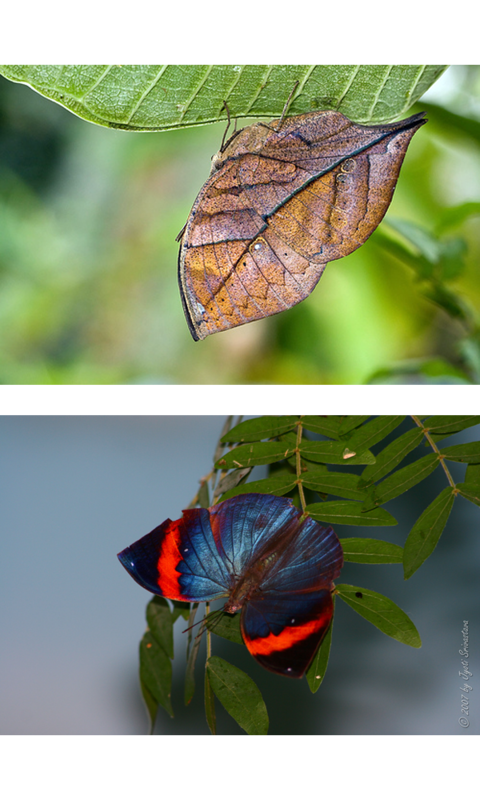 Another master of camouflage is Indian Leafwing [ Kallima paralekta]. Family: Brush-footed butterfly [ Nymphalidae] . This amazing creature looks just like a dry leaf. It often nestles amongst the dry leaves in autumn, or perches on a drying twig. 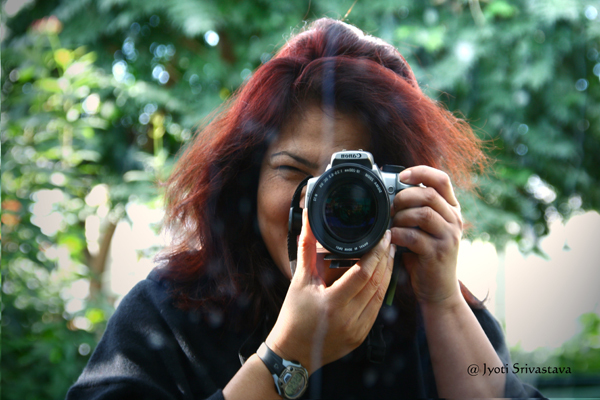 I have a short note written from my visit [November, 2007].. I remember a group of four senior citizens were standing in the Haven and suddenly this butterfly opened it’s wings, showing it’s brilliant blue-orange wings. Someone from the group saw it and exclaimed “O my God, that is a butterfly!” Soon all the four were staring at it, with childlike amazement. It was nice to see the seniors in such innocent awe and joy! I have to add that “Kallima paralekta” is one of the most brilliant camouflage that I’ve have seen. Sexual dichromatism is a form of dimorphism in which the two sexes of the same species exhibit different characteristics beyond the differences in their sexual organs, like difference in coloration and marking. Sexual dichromatism is however extreme in Archduke Butterfly / Lexias pardalis. Family: brush-footed butterfly family / Nymphalidae. These are tropical forest-dwelling butterflies that are common throughout Southeast Asia and Australasia. The two sexes appearing entirely different. Top Image is of male Archduke. It’s dorsal wing surfaces are a dramatic combination of velvety black forewings and metallic blue-green to violet covering the margins of the forewings and hindwings. Below image is of a females Archduke. Its dorsal wing surfaces are a drab brown, with small yellowish white spots. 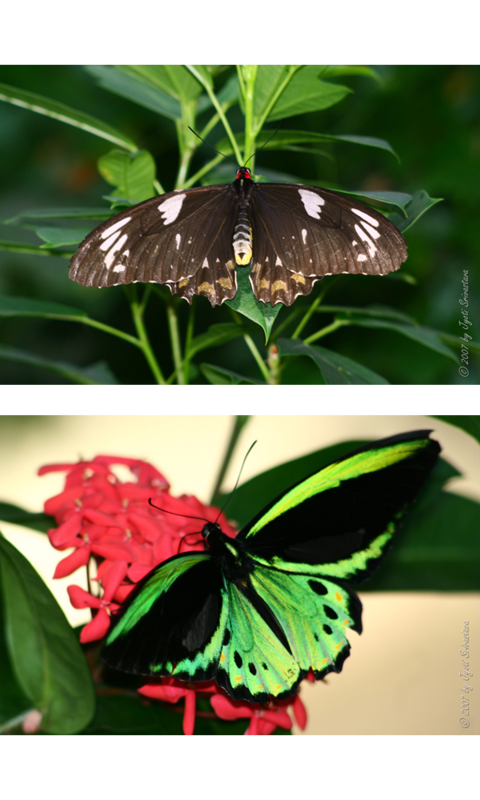 Sexual dimorphism can also be seen in Cairns Birdwing [Ornithoptera euphorion]. Family: Papilionidae. Cairns Birdwing is Australia’s largest endemic butterfly species. Its huge size got it the name “birdwing”. Cairns Birdwing diplay sexual dichromatism. Birdwing females are about one-third larger than males of the same species, with females reaching a wingspan of up to 16 cm. Males are usually a few centimeters smaller. Their colors also vary, as males are usually the more vibrant. Top image: Female Cairns Birdwing. 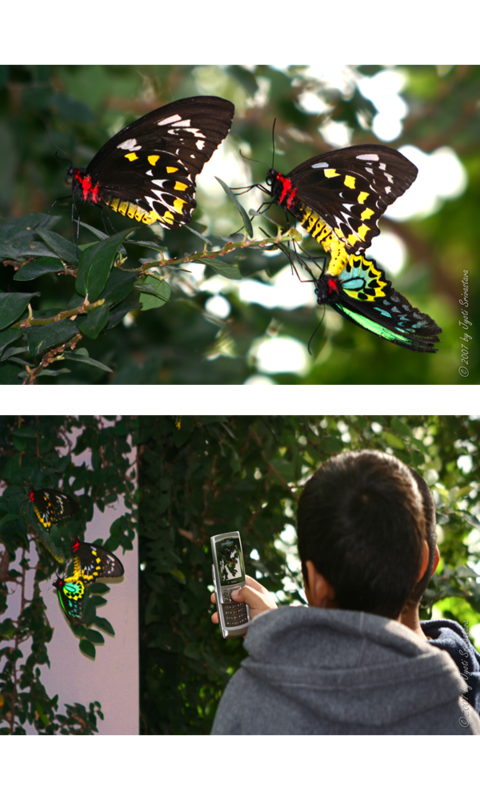 Bottom image: Male Cairns Birdwing. Polymorphism is difference in forms or “morphs”. There maybe difference in colors, markings and number of attributes within a single species. Sexual dichromatism is a form of polymorphism. Asian swallowtail butterflies commonly known as Mormons. Three of these species are common: The Scarlet Mormon Papilio rumanzovia], Great Mormon [Papilio memnon] and Common Mormon [Papilio polytes]. They are all beautifully colored in black and white, often with red marking. However each of the Mormons is sexually dimorphic [males and females differ], and females are polymorphic [more than one wing pattern]. Female morphological variations include: presence or absence of tails, hindwing pattern, forewing pattern, color of abdomen and wings. Form example, take the Great Mormon. The male is nearly uniform bluish black, with rounded hind wings, and never varies. 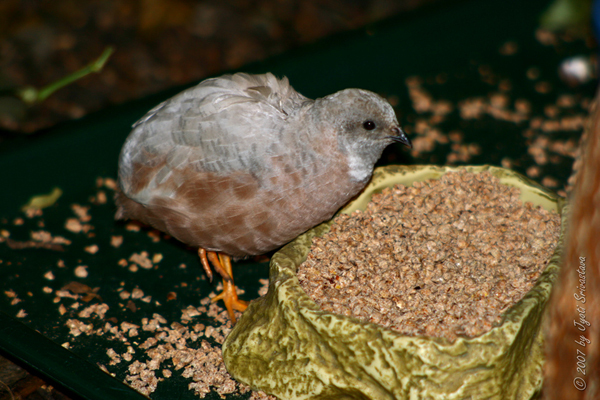 One portion of the females resemble the males in shape, but are colored brown or ashy, and with white markings on the hind wings. Another set of females differ remarkably in the shape of the wings, and also have white lines radiating from the base of the wing. 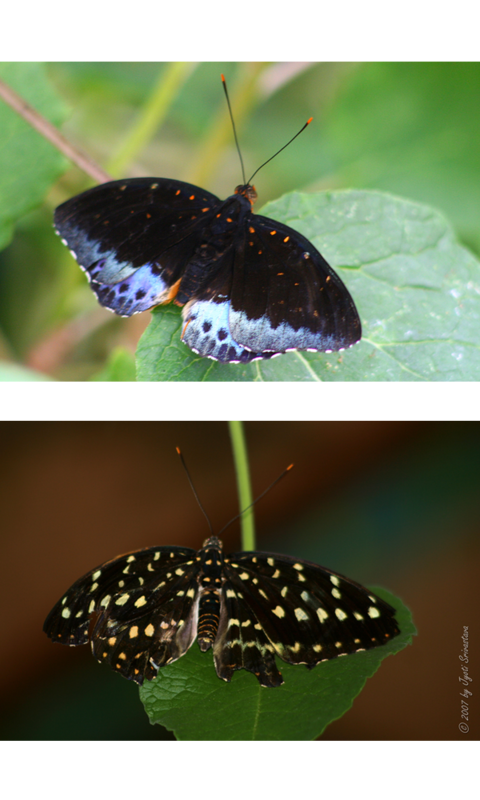 P. memnon females have since been determined to occur in three different morphs. Similarly, female P. polytes have several distinct female morphs, as do P. rumanzovia females while the male of each species does not vary. Most males use one of two strategies for finding a suitable mate: perching or patrolling. Some males perch on an open branch and wait for their mate, other males, actively patrol an area, searching for a receptive female. When the male butterfly recognizes a female of his own species, he pursues her and thus begins the rituals of courtship. Mating starts as the two attach themselves by the tips of their abdomens. Butterflies mate facing in opposite directions with their abdomens attached. Males mate numerous times during their short lives. Most females mate only once. After mating, the female embarks on a mission – to search for the proper host plant on which to deposit her eggs. However, this Butterfly Haven do not breed butterflies. So they remove host plants for each species. This is a common practice among such butterfly havens to remove host plants. 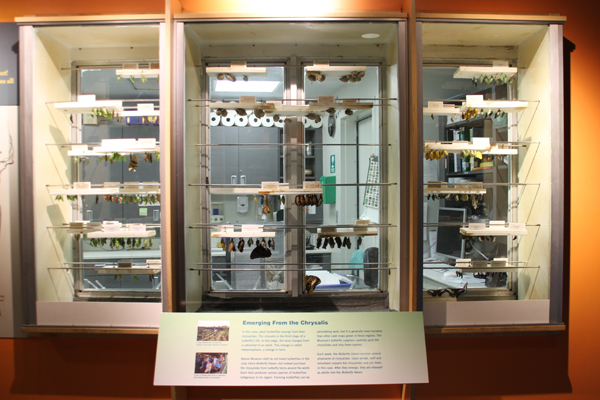 The museum purchases chrysalises from butterfly farms around the world. 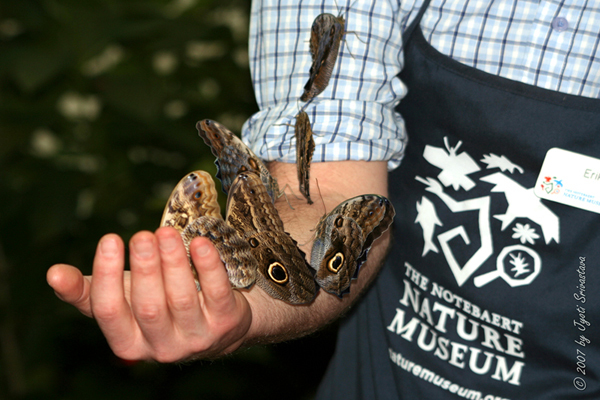 Nature Museum staff do not breed butterfly in the Judy Istock Butterfly Haven. 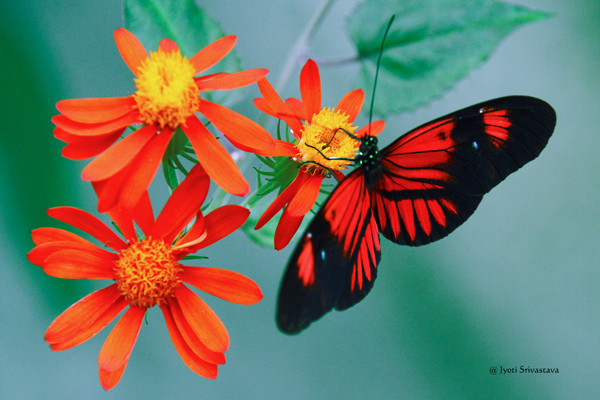 Instead they purchase the chrysalises from the butterfly farms from around the world. 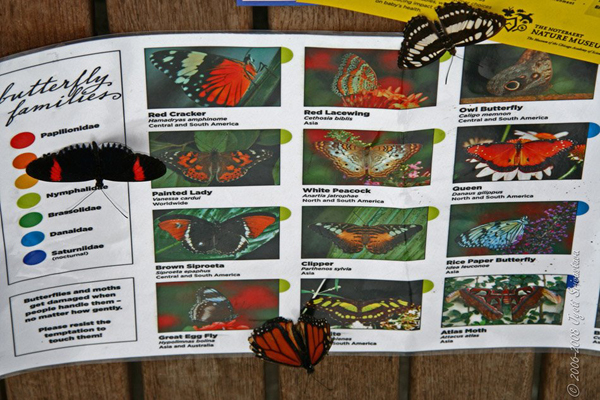 Each farm produces various species of butterflies indigenous to its region. 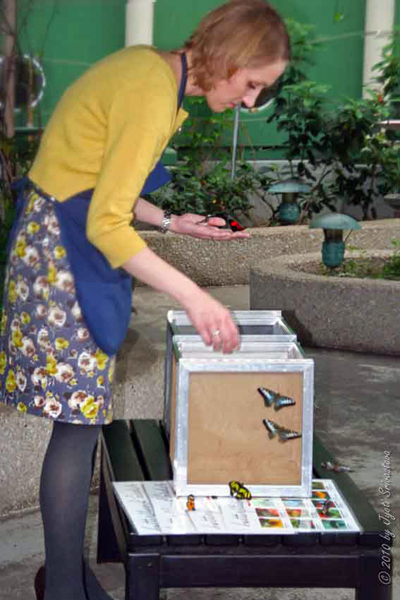 The Museum butterfly suppliers carefully pack the chrysalises and ship them express. 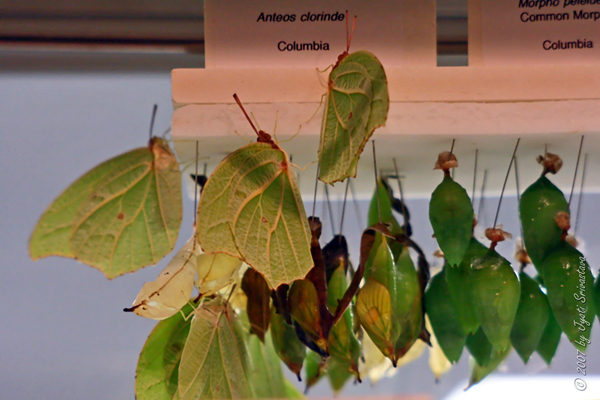 Each week the Butterfly Haven receives several shipments of chrysalises. Upon arrival, staff unpack the chrysalises and pin them in this case. It takes about two to three weeks for the butterflies to emerge. Then the butterflies are released into the haven. The chrysalis is the third stage of a butterfly’s life. 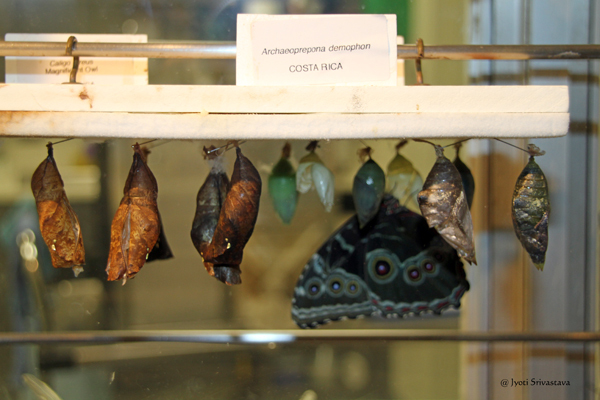 To grow into an adult they go through 4 stages: egg, larva [caterpillar], pupa [chrysalis] and adult butterfly. In the chrysalis stage the larva changes from caterpillar to adult. 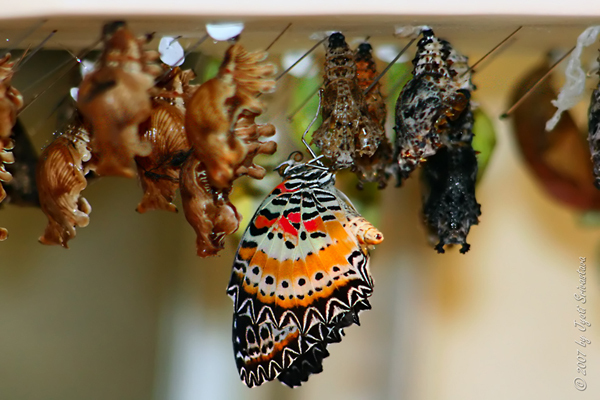 This change is called metamorphosis – a change in form. Butterflies usually have clubbed antennae but moths have fuzzy or feathery antennae. Butterflies normally are active during the daytime while most moths are active at night. When a butterfly rests, it will do so with its wings held upright over its body. Moths, on the other hand, rest with their wings spread out flat. Butterflies will, however, bask with their wings out-stretched. Butterflies are generally more brightly colored than moths. However, this is not always the case. There are some very colorful moths. The Atlas Moth [Attacus atlas] has the largest wing surface area of all moths. 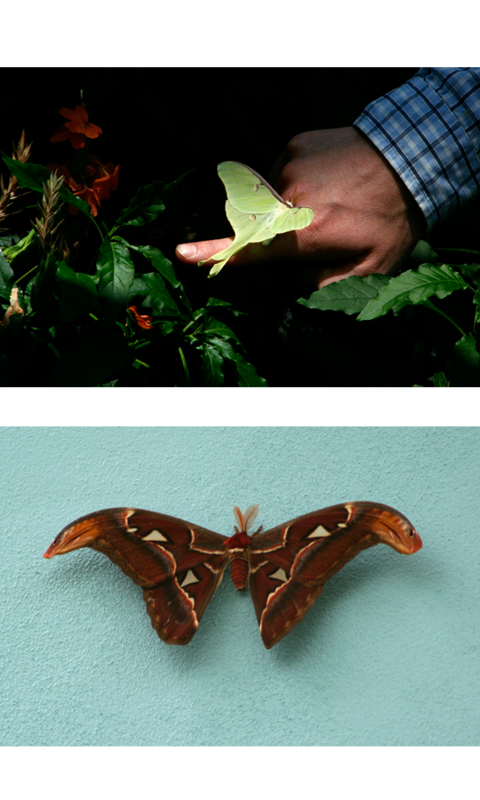 Atlas Moths don’t eat at all throughout their adult life which lasts for about two weeks. An adult Atlast Moth doesn’t even have a mouth and lives off fat reserves built up when it was a caterpillar. They quickly mate, lay eggs, and die shortly thereafter. Atlas Moths are found only in Southeast Asia. Luna Moth /Actius luna …This nocturnal insect is also found in deciduous hardwood forests in North America, from Canada to Northern Mexico. The Butterfly Haven even has some birds. Its part of the self-contained eco-system maintained in the Haven, with a small fountain and water-pool, tropical trees, flowers and birds. Plants refresh the air and lock in moisture. The flying birds feed on fruit, nectar and seeds while the ground dwelling ones feed on ants, roaches and, yes, dead butterflies. They are the groundkeepers and pest control. Some other birds at the Haven are Violaceous Euphonia [Euphonia violacea], Violaceous Euphonia [Euphonia violacea] and Button Quail [Coturnix chinensis]. At the exit stands a big mirror, with the sign: “Please leave all butterflies inside of the Butterfly Haven.” Visitors check themselves in the mirror when they leave the haven, gently brushing off any hitchhikers. This is in accordance to the U.S. department of agriculture’s limitation on exotic animals. 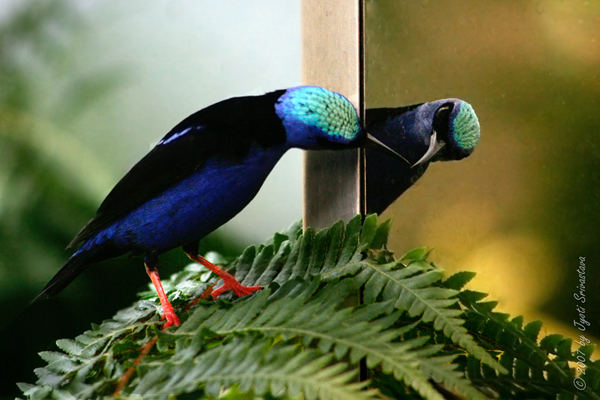 Once I saw a bird looking at itself in the mirror – a Red-legged honeycreeper [ Cyanerpes cyaneus]. It is till date, one of the favorite photos that I have taken. 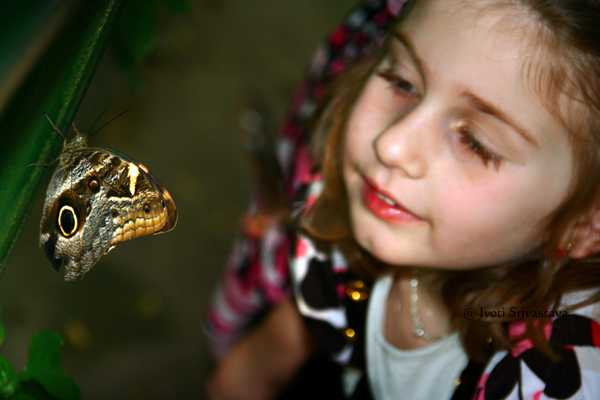 The Butterfly Haven is indeed a hidden jewel of Chicago! 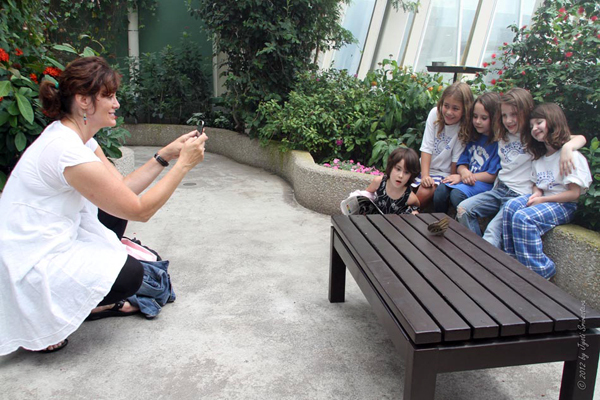 It is heartening to see parents bring their kids to the Butterfly Haven! I have seen a many moms with kids to the haven! Go Nature Moms! 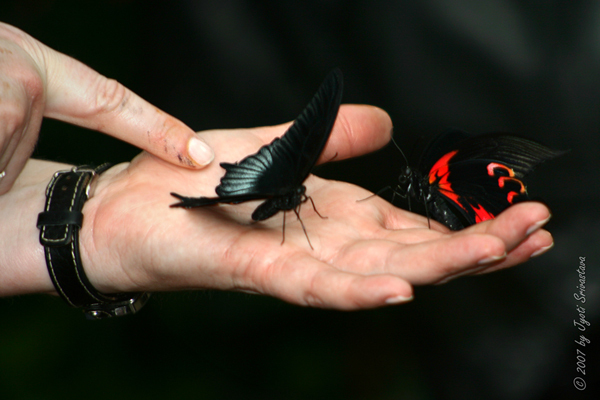 A 3 minutes video of butterflies at Judy Istock Butterfly Haven.